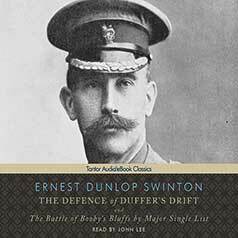 First published in 1907, The Defense of Duffer's Drift is a classic essay on small unit tactics based on author Ernest Dunlop Swinton's experiences in the Boer War in South Africa. First published in 1907, The Defence of Duffer's Drift is a classic essay on small unit tactics based on author Ernest Dunlop Swinton's experiences in the Boer War in South Africa. In a series of dreams, Swinton's character Lieutenant Backsight Forethought works through a number of possible approaches to defending a piece of land known as the Drift. Each time, he makes fatal errors, but with each successive dream, Forethought corrects his previous mistakes and learns new lessons. The resulting work is an accessible, insightful look at small unit tactics and leadership that is as useful today as it was in the early 20th century. This edition also includes The Battle of Booby's Bluffs by Major Single List.